!! OMG we were robbed: The Grammys !! I think last night was the first time I watched a whole Grammy Awards Show without getting frustrated, bored, and just changing the channel. I mean, I got frustrated and bored, but I didn’t change the channel. Poor Feisty-Feist! Our Canadian hopeful was shut out of her four nominations and didn’t get a Grammy last night. But she got to perform, so hopefully that’s good for business. 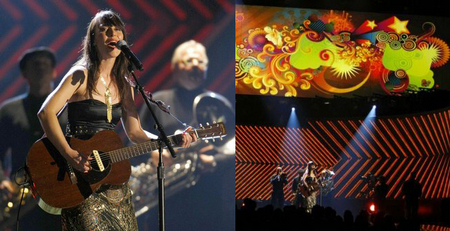 See Feist’s performance of 1234 after the jump. 3 Comments on "OMG we were robbed: The Grammys"
I get the feeling the only way anyone is going to be able to sing a standard anymore is if they have a black and white film of a dead icon singing with them. It’s kinda sad considering Keys and Sinatra would probably hate one another.